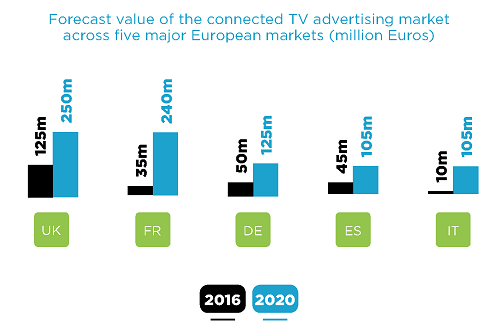 SpotX, the leading video advertising and monetisation platform for media owners, has unveiled an infographic forecasting the growth of the connected TV advertising opportunity in Europe. The visual representation of research commissioned by SpotX, shows the growth of advertising on connected TV, defined as content served to the TV screen via the open internet through devices including smart TVs, game consoles, streaming media services such as the Amazon Fire Stick, Chromecast and Apple TV and pay TV subscriptions. Rapid growth is predicted with an increase of over 200% from €225m in 2016 to €825m in 2020. The infographic is based on research conducted by MTM, a research and strategy consultancy, and commissioned by SpotX to discover the size of the connected TV advertising opportunity in Europe. The advancement of AVOD (advertising-funded Video-on-Demand) technology and the desire from brands and agencies to advertise alongside premium programmes has increased steadily, and the research shows that the market is now set for rapid growth across the big five TV advertising markets in Europe. The infographic shows the UK is Europe’s largest market for connected TV advertising, expected to be worth €250m in 2020. The UK market will have a 19 percent compound annual growth rate (CAGR) which will be achieved through increased user engagement with connected TV technology combined with broadcasters’ commitment to providing market leading services such as the ITV Hub and BBC iPlayer. Rapid connected TV advertising growth is pictured in Italy with participants in the research predicting an 80 percent CAGR between 2016 and 2020. The infographic shows the market is forecast to be €105m in two years time, growing from €10m in 2016. Developments in audience measurement signal the Italian industry is preparing for adoption as consumer interest in video on demand increases. Alongside a strong culture of IPTV, the infographic illustrates that France will have the second highest connected TV advertising revenue with industry experts anticipating €240m to be generated by advertising delivered via the open internet to the TV screen in 2020. Market drivers such as good broadband penetration and speed are in place to sustain this growth and broadcasters will increase their investments into connected TV apps and services. The infographic charts the growth of connected TV advertising in Germany from €50m in 2016 to €125 in 2020 with a CAGR of 24 percent, forecasting Germany to be the third largest market in two years time. The market enablers displayed in the infographic show that the investment is being made in the German market but that user adoption is slightly behind other countries in Europe with 50 percent of the population owning a smart TV. Connected TV advertising is shown as €45m in 2016 in Spain with growth expected to reach €105m in 2010 which will equal revenues generated in Italy. Spain will see a predicted CAGR of 24 percent driven by demand from advertisers and agencies for connected TV inventory and by increased penetration of smart TVs in the market. The infographic is based on research titled ‘The Connected TV Advertising Opportunity in Europe’ commissioned by SpotX, from MTM. The full report can be downloaded here.